So over the Stampede, we had a few get-togethers. All involved food on a stick – deep-fried or not. 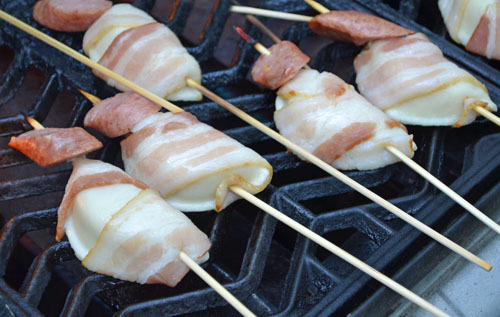 I tweeted out a picture of these bacon-wrapped peroghies on a stick minutes before putting them on the grill, and the twitterverse screamed out for a recipe. You won’t need a recipe per se, but here’s how you do it: boil peroghies of your choice, drain them and set them out on paper towel – if they’re too wet they’ll be slippery to wrap. 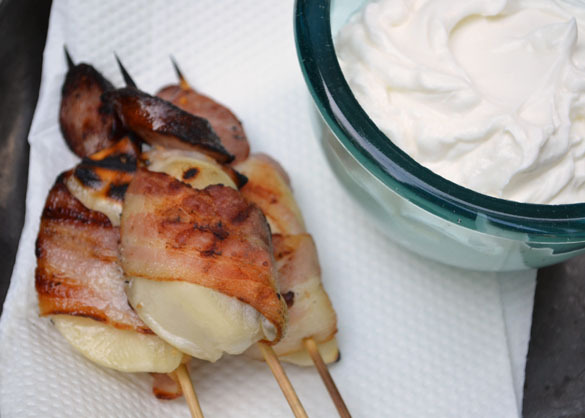 Cut regular bacon in half crosswise, and wrap each peroghy with a piece of bacon. Soak some bamboo skewers and poke them through, making sure it goes through a corner of the bacon on each end of the peroghy. That’s it. I had some Spragg’s sausage, and so sliced it and slid a piece onto each skewer at the end. You could do this, or not. Or thread two peroghies on each stick – whatever works for you. Preheat your grill and cook them over medium (so you don’t incinerate your skewers), turning as the bacon cooks and shrinkwraps each peroghy. 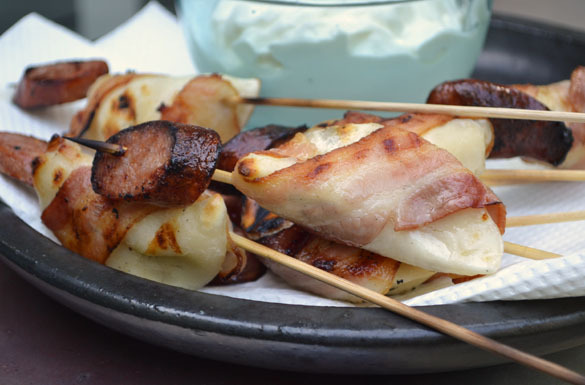 Serve with sour cream for dipping, and cold beer for washing them down. OMG…………….My Ukrainian Heritage is Screaming!!!!!!!!!!! How brilliant is this!!!!!! I love you Julie! Yummie! I was planning to make peroghy this weekend, too! You crazy Canadians. This actually makes poutine look like health food. But we’re crazy too in NYC and I can’t wait to try this. So good. I need to do this. Are the peroghies homemade? Shrink wrapped ‘roghies… so much fun! Another excuse to have a mass production ‘roghie making party! You. Are. KILLING me. This looks amazing!!! I hope this reply works, still learning Facebook. These look amazing and I will try on my sister and bro in law when they visit next mo.. Seriously? I can’t believe you made peroghies look even more amazing than they normally do! Must Try This Soon! how wonderful! I have to do this! Hey There! This is my first time stopping by your blog, found via Pinterest! I have to be honest – I don`t usually follow food blogs – but OMG – you are officially number 4 on the list of blogs I follow! And the ONLY food blog! I LOVE to cook, and something about the food you eat/make matches my taste buds EXACTLY. I look forward to all you do in the future! Just spent the last hour looking at and pinning tons of your recipes! P.s Did I read something about you being Canadian too? This was amazing: the key to a man’s heart! OMG!! This is one that I definitely will do! Everything goes better with bacon. Especially love the comment of the cold beer to go along with it!